JENN: We haven't done a Photographic Memory in forever, so let's do a really good one now. I LOVE THIS PICTURE. JENN: This is us waiting around in corral B for the 2014 Tinker Bell Half Marathon in Disneyland, back before they moved it to May. January weather in Anaheim! JENN: I dunno. It's Mother's Day Weekend or some such. They have a Star Wars Half in January now. MOON: Star Wars?! Oh, barf. Oh, wait, that's a Disney thing now, right? JENN: Yup, they own it! I don't think most people were pleased with the change, but whatever. We got in under the wire! This was my third-ever half marathon and my second runDisney race and I was so happy and excited! I mostly remember it was the first steps we ever took in Disneyland proper. And I PR'd! (That PR would stand until the Parks Half.) Good times, good times. MOON: Haha, is it bad that I remember my text messages to Christian that day? MOON: We were a new couple then. Look at us now. About to uproot and move somewhere. I wonder what races we'll be looking back on in five years' time. Or, we could look back on posts about races we did a long time ago! 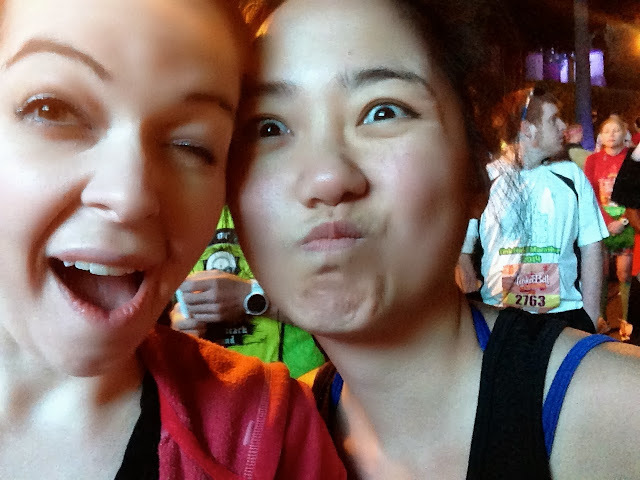 JENN: Let's run another race together ASAP! Got a silly race photo to share? How do you like to look back at your races?